Slash was the man with the top hat that saved the Music Scene in the 80’s with his signature Gibson Les Paul and Marshall combination. He and his band, Guns n’ Roses were at the top of the world, until Slash left the band to work on his various side projects. Not much was heard from Slash until 2004 when he started Velvet Revolver with members of; Stone Temple Pilots, Wasted Youth, and his previous band Guns n’ Roses. Eventually Velvet Revolver became stagnant, and Slash put together his first solo album with various guest singers and musicians. He then assembled a band of touring musicians to perform his new material. 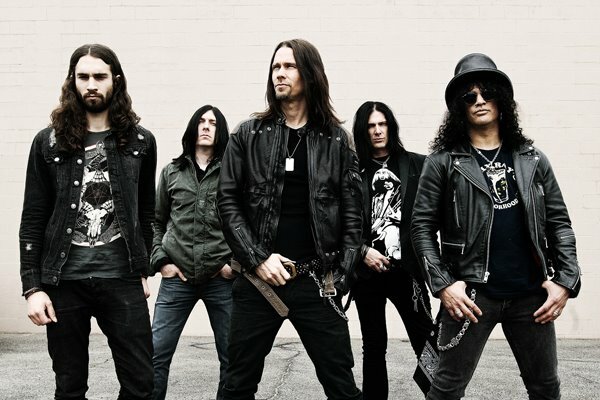 This touring band, minus guitarist Bobby Schneck became his recording band, The Conspirators. This band features vocalist Myles Kennedy, bassist Todd Kerns, and drummer Brent Fitz. Together they created what became Slash and The Conspirators new album, Apocalyptic Love. Apocalyptic Love is a great album featuring 13 tracks, including the single, “You’re a Lie”. 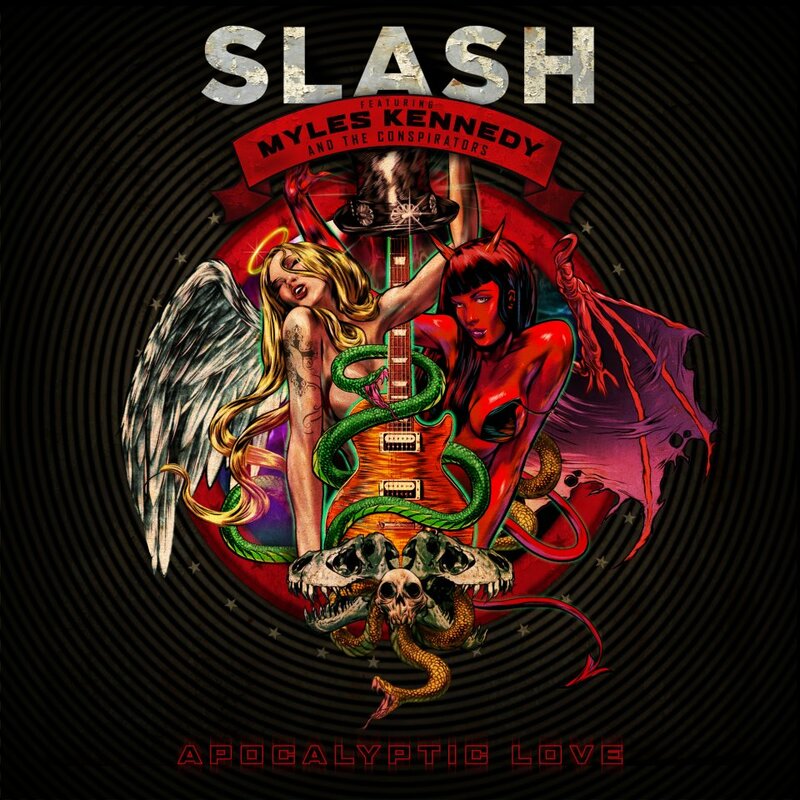 The album kicks off with the title track, “Apocalyptic Love” which features a great wah-wah drenched riff that sliters in and out of the song. “One Last Thrill” follows the title track, and is a souped-up blues number. I imagine it would be a great track to be driving to. Lyrically the song is very dark focusing on a reckless past, and hoping for the last rush before one dies. The track on the album is, “Standing in The Sun” which sounds a lot like Kennedy’s other band, Alter Bridge. To me the song doesn’t seem to match the intensity of the rest of the album until about the 1:20 mark when an awesome riff comes in and hits the listener. The guitar solo on the track is one of my favorites, and features Slash’s excellent melodic phrasing. The single, “You’re a Lie” follows and takes the album up a notch, and is by far my favorite track on the album. Slash’s guitar sounds excellent on the track, as do Kennedy’s vocals. Fitz’s drums also provide a steady backbeat. The next track that I found interesting was entitled, “Halo”. This track features a very interesting dissonant riff. Kennedy’s vocals come in for the verse which slows down, but then when the chorus comes in it speeds up again. The Song is odd, but it caught my attention. “Anastasia” is the eighth track on the album, and It has a beautiful classical sounding intro that gets rudely interrupted by a very classical sounding electric guitar arrangement, that leads into a bluesy metal riff. The only thing I don’t like about this track are the vocals which sound thin compared to the rest of Kennedy’s MVP performance. “Bad Rain” is the tenth track on the record, and is a great groove oriented track with very tight playing from the band especially the rhythm section who keep a steady beat going especially at the 2:23 mark when Slash plays a simple but tight solo. “Hard and Fast” is next up and is a great track that I think should have been placed alongside, “You’re a Lie” due to its overall intensity. I hope that “Hard and Fast” follows “You’re a Lie” as the second single, as it is just a pure rock and roll jam. Overall I believe Apocalyptic Love is a great album featuring a bunch of great songs by even better musicians. I hope Slash keeps this band up because in my honest opinion this album is better than what Velvet Revolver yielded on their 2007 release, Libertad.